ST. JOHN’S, Antigua – All three matches in the West Indies Championship produced intrigue following play on Friday. Front-runners Guyana Jaguars – led by Clinton Pestano and fellow pacer Romario Shepherd – gained a slim first innings lead on Leeward Islands Hurricanes and were batting to extend their overall advantage at the Guyana National Stadium on the second day of fifth-round matches. 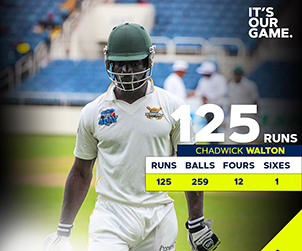 At the same time – Opener Chadwick Walton struck his fifth first-class hundred to lead Jamaica Scorpions’ best batting performance for the season and put them within reach of a first innings lead against Windward Islands Volcanoes at the Grenada National Cricket Stadium. And, a destructive spell from Jamaican fast-medium bowler Marquino Mindley had Barbados Pride scenting victory over Trinidad & Tobago Red Force in their day/night contest at the Brian Lara Cricket Academy. Resuming from their overnight total of 57 for three, the Hurricanes saw Terrance Warde and Akeem Saunders extend their fourth wicket stand to 57. The 33-year-old Walton was undefeated on 113 and led a strong reply for the Scorpions, as they hunt their first win after losing all three of their matches this season. Mindley grabbed 4-29 from 12 overs to spark a Red Force batting collapse, after the Pride earned a hard-fought, 45-run first innings lead.